Despite the best efforts of the city’s planners and developers to turn Dublin’s Upper Abbey Street into a representative example of late 20th century mediocrity, a couple of buildings survive to show what a splendid thoroughfare this once was. In particular, Nos. 124 and 125, originally domestic residences dating from c.1750 merit more than the passing glance they now typically receive from passers-by. At least the latter is being used, but No.124, at one time being used as a radio studio, has now been standing empty for some time, and is beginning to show inevitable evidence of neglect. At the time these properties were built, this area of Dublin was the most prestigious in the capital, yet all parties who might help to revive its fortunes appear determined not to do so. Another often overlooked building in central Dublin: the Printing House in Trinity College. It was designed in 1734 by Richard Castle to conclude an allée at the other end of which was the Anatomy House built in 1711 to a design by Thomas Burgh (and long-since demolished). 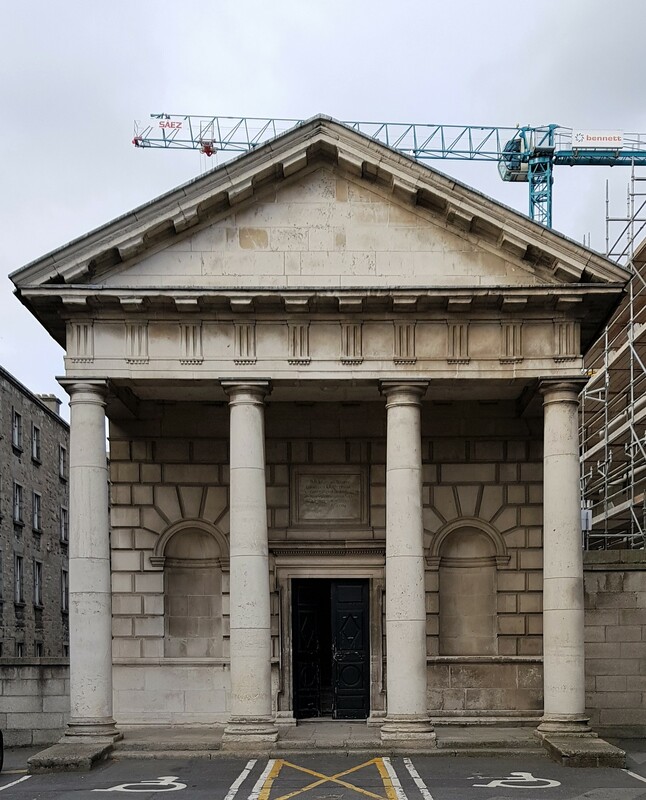 The building’s most notable feature is its pedimented Doric portico with rusticated façade behind, all of Portland stone, which suggests this is a classical temple rather than a more mundane printing house. Nevertheless it was here that the first book in Ireland entirely in Greek (an edition of Plato’s Dialogues) was produced, followed by many other works. A plaque in Latin above the doorway indicates the building is dedicated to the Anglican clergyman John Sterne, Bishop of Clogher, who in 1726 provided £1,000 for its construction; on his death in 1745 he left his considerable collection of manuscripts to the college library. At the moment, this part of the campus is rather a mess owing to building work, not least student accommodation on a site to be called Printing House Square: when this finishes, one hopes due attention will be paid to the building whence the development derives its name. Preoccupied with inevitable traffic jams, the many motorists using Dublin’s Pearse Street are unlikely to throw a glance at the old church on their right-hand side. This is St Mark’s, which dates from the early 18th century when a new parish was created separate from that of St Andrew’s. Building work began in 1729 but the church was only roofed 23 years later. The architect responsible is unknown, but in any case the building is notable primarily for its want of external ornamentation, with sturdy limestone rubble walls. The entrance at the west end has a substantial cut-granite door with a smaller Diocletian window above: the arrow slits on either side, now blocked, once held glass to admit light to the interior spaces. The sides of the building have five tall and five short windows, one above the other and the east end has a Venetian window to light the chancel. Much altered in the 19th century, the interior retains its galleries supported by Corinthian columns. Unlike many other Church of Ireland churches in the city, St Mark’s is still in use, now by an evangelical Christian group for services. Drumcondra House, County Dublin was discussed here a month ago (see An Italian in Ireland, February 11th 2019). That property was built for the early 18th century lawyer and politician Marmaduke Coghill who had inherited land in the area from his father. Prior to having a new residence constructed, Coghill lived in an existing house close by called Belvedere (sometimes spelled Belvidere). The Civil Survey of 1654-56 notes ‘There is upon the premises a faire brick house, slated…’ That building was extensively altered in the following decade by another lawyer, Sir Robert Booth and it was after his death in 1681 that Marmaduke Coghill’s father moved there. 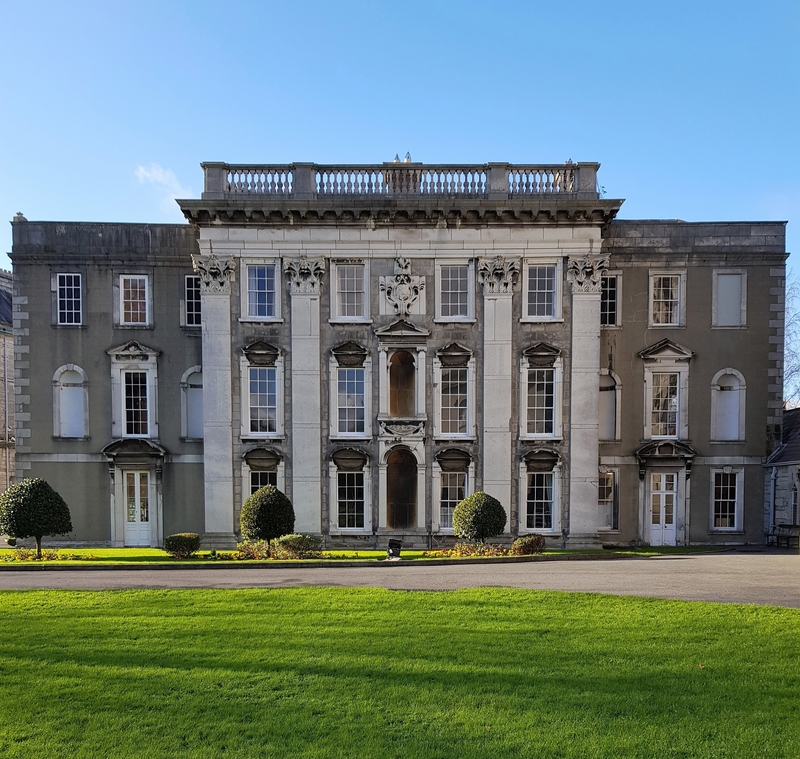 Once Drumcondra House was built, Belvedere was let to Henry Singleton, who in 1740 became Chief Justice of the Court of Common Pleas and fourteen years later Master of the Rolls. Mrs Delany records that in 1750 he was making extensive alterations to Belvedere, including the addition of a large drawing room to the rear of the building. This room has a wonderful ceiling with elaborate plasterwork. The stuccodore responsible is unknown, but stylistically the ceiling bears similarities to those a few miles away in Glasnevin House (see Misjudging a Book by its Cover, December 22nd 2014) which is attributed to the St Peter’s Stuccodore. Might this be another example of his craftsmanship? In 1863 Joseph Sheridan Le Fanu published one of his most successful works The House by the Churchyard. The book, which like many 19th century novels was initially serialized and accordingly has a convoluted plot, is set in the village of Chapelizod to the immediate west of central Dublin. Sheridan Le Fanu knew the area well: not long after he was born in 1814 his father, an Anglican clergyman, was appointed chaplain of the Royal Hibernian Military School (now St Mary’s Hospital) in the Phoenix Park which lies directly north of Chapelizod. This is the eponymous House by the Churchyard, standing – just about – outside the gates of the adjacent St Laurence’s Church. The building is believed to date from c.1740, just a few decades before the period in which Sheridan Le Fanu’s novel is set. It has been standing empty and neglected for some years and now looks to be in a seriously dilapidated condition. Unless there is an intervention soon, it will be necessary to write another book, this one called The Lost House by the Churchyard. Incidentally, this is not the only historic property in Chapelizod in perilous condition: a little to the east, the last surviving house from a terrace built around 1700 is boarded up and on the verge of disintegration. Further to Monday’s post about Drumcondra House, Dublin, here are portraits of the two men discussed. Above is the funerary monument to Marmaduke Coghill erected in the adjacent church by the deceased’s sister Mary. It was carved by (and bears the signature of) the Flemish sculptor Peter Scheemakers who was based in London: this work seems to have been his most important Irish commission, aside from a series of fourteen busts which can be seen in the Long Room of the Old Library, Trinity College Dublin. Clearly proud of her sibling, Mary Coghill made sure his extensive list of achievements and virtues were recorded on the substantial base below the central figure. Meanwhile in the entrance hall of Castletown, County Kildare can be seen this portrait of the Florentine architect Alessandro Galilei, responsible for the initial design of the house, and perhaps of Drumcondra House too. Painted by Giuseppe Berti in 1735, it shows Galilei seated before an open window through which can be seen the façade of San Giovanni in Laterano which he had designed three years earlier: plans for it can also be seen below his left hand. In May 1717 Robert, first Viscount Molesworth wrote from England to his wife Letitia with advice of a planned return to Ireland and the fact that ‘I will carry with me the best architect in Europe.’ The latter was a young Florentine, Alessandro Galilei (1691-1737) who had been brought to London in 1714 by Lord Molesworth’s eldest son John, for the previous three years British Envoy to Florence. It was presumably there that he met Galilei and when Molesworth was recalled to London, he invited the architect, then aged 23, to accompany him with the expectation of commissions from English clients. The Molesworths, père et fils, were key figures in a group of enthusiastic cultural patrons described by the viscount as the ‘new Junta for Architecture.’ Their mission: to reconfigure architectural design on these islands in the neo-classical style, or what one of them called ‘Grecian & best taste’. Although Galilei spent four years in England, with a six-month interlude in Ireland in 1718, and despite backing from the Molesworths and other members of their circle, he achieved almost no success: for example, he made designs for new churches then being commissioned in London but none of them was executed. Similarly, despite being recommended by Lord Molesworth to design St Werburgh’s in Dublin in 1715, he did not get the job: the viscount later wrote that those behind the commission were ‘uncapable of comprehending what an artist Galilei is’. The fact that he was a Roman Catholic is thought also not to have helped his cause. Understandably in August 1719 he returned to Florence, where he was created Engineer of Court Buildings and Fortresses by the Grand Duke of Tuscany. Despite further importuning from the Molesworths and others, he never returned to this part of the world. In 1730, the Florentine pope Clement XII invited him to Rome where his best-known work, the façade of San Giovanni in Laterano (1732) can still be seen: he died in the city five years after its completion. Marmaduke Coghill was born in Dublin in 1673, eldest son of Sir John Coghill, Judge of the Prerogative Court and one of the Masters in Chancery. Marmaduke was something of an infant prodigy, entering Trinity College at the age of fourteen and graduating as a Bachelor of Law four years later. At 19 he was a member of the Irish House of Commons, sitting for the next 50 years first representing the Borough of Armagh and then Dublin University. In due course liken his father before him he served as a judge of the Prerogative Court and later became Chancellor of the Exchequer in Ireland. He was described by a contemporary as being ‘a zealous and active friend, and of an engaging and affable manner, but he was not blessed with good looks’ (another account called him ‘a fat apoplectic looking old gentleman with short legs and a shorter throat’). Following his father’s death in 1699 Marmaduke Coghill inherited land on the outskirts of Dublin, in an area called Clonturk but now known as Drumcondra. Initially he lived there in an extant house which still stands, Belvedere (or Belvidere), of which more on another occasion. However, in the early 1720s he embarked on building a new residence not far away, Drumcondra House. Here he lived with his sister Mary, like him unmarried, until his death in 1738; five years later she built a church close to the house and inside erected a monument to her brother sculpted by Peter Scheemakers. Following her death, Drumcondra House passed to a niece, Hester Coghill who was married to Charles Moore, Earl of Charleville. The family subsequently rented out the property as a private residence until the early 1840s when acquired by a Vincentian priest who established a Missionary College on the site, All Hallows. A few years ago the property passed into the hands of Dublin City University to become part of that institution’s campus. So what are the links between Drumcondra House and Alessandro Galilei? As mentioned, the latter had scant success gaining commissions while in either England or Ireland, but the one building with which he has always been associated is Castletown, County Kildare. While Galilei was in Ireland with the Molesworths, he seems to have met William Conolly, Speaker of the Irish House of Commons and the country’s richest man: it was for Conolly that the architect proposed the basic design of Castletown’s façade, although work on the building did not begin until 1722 (by which time Galilei had long since returned to Italy) and is thought to have been overseen by Edward Lovett Pearce. Marmaduke Coghill was a friend and political ally of Conolly, so there is no reason why he should not also have met Galilei and indeed likewise have asked him for advice and designs for his own new residence in Drumcondra. To the immediate east of the main house is the shell of a classical temple (see below), its pedimented stone façade featuring a central doorcase with segmental pediment flanked by windows with regular pediments on either side of which is a pilaster topped with Corinthian capital. The design for this building has long been attributed to Galilei, but why not also therefore the façade of the house which the temple faces? As can be seen by the photograph on the top of this page, it has many of the same features albeit on a larger scale, suggesting that whoever was responsible for one was also architect of the other. As Maurice Craig once wrote of the façade, ‘there is nothing much resembling it anywhere else in Ireland.’ Matters are complicated because the south face of Drumcondra House, altogether more severe and pure (a two-storey pedimented breakfront imposed on the central portion of an otherwise plain, three-storey, seven-bay block) was designed Coghill by Edward Lovett Pearce in 1726. And of course, that was precisely when Pearce was also working at Castletown for Coghill’s friend William Conolly. All of which suggests that Galilei achieved more in Ireland than is usually thought, and certainly more than he ever did in England. Meanwhile, as these other images will show, the interiors of Drumcondra House, currently undergoing a gradual programme of restoration and refurbishment, reveal some of the most intact early 18th century panelled rooms in the country. A building worthy of further study. A pair of angels executed in mosaic line a portion of wall in what was once the chancel of a chapel in St Patrick’s College, Drumcondra, Dublin. Established in 1875 as a Roman Catholic teacher training college, St Patrick’s was once the country’s largest such institution. Its chapel dates from the end of the 19th century when designed by the popular church architect George Ashlin. The lavish interior decoration dates from the early 1900s when a number of different companies worked on the site: the mosaics came from the Manchester-based company of Ludwig Oppenheimer Ltd. Like many other such buildings, this one underwent alterations following the Second Vatican Council, when a new chapel was designed for the college by Andy Devane. Many of the features of the old one were removed (its Stations of the Cross are now in a church in Tullamore, County Offaly) and the space was converted into a reading room. St Patrick’s College is now part of Dublin City University. A detail of Harry Clarke’s Eve of St Agnes window, now in the Hugh Lane Gallery, Dublin. Inspired by Keats’ poem of the same name, the window was commissioned in 1923 by Harold Jacob (of the Jacob’s Biscuit family) for his father’s home on Ailesbury Road. Completed within a year, the window was duly installed and then moved to a couple of other properties before being acquired by the gallery forty years ago in 1978. The history of the window and the inspiration for its design (not least the influence of the Ballets Russes, and its sumptuous sets and costumes by the likes of Léon Bakst) in an essay by Jessica O’Donnell included in the just-published Harry Clarke and Artistic Visions of the New Irish State. The book seeks to contextualize the artist not just within Ireland but also the broader modernist movement by examining different aspects of his output: Angela Griffith, for example, writes on the two promotional booklets published by Jameson whiskey in the mid-1920s, for which Clarke provided illustrations, while Fiona Bateman looks at windows produced by the Clarke studios for Irish Catholic Missionaries in Africa (apparently many of these remain in churches in Kenya, Nigeria and other countries). Rightly dedicated to the memory of the late Dr Nicola Gordon Bowe (the first anniversary of whose death falls in a couple of weeks), the book further illuminates our knowledge of cultural life in Ireland during the first years of the independent state. Harry Clarke and Artistic Visions of the New Irish State (ed. By Angela Griffith, Marguerite Helmers and Róisín Kennedy) is published by Irish Academic Press.